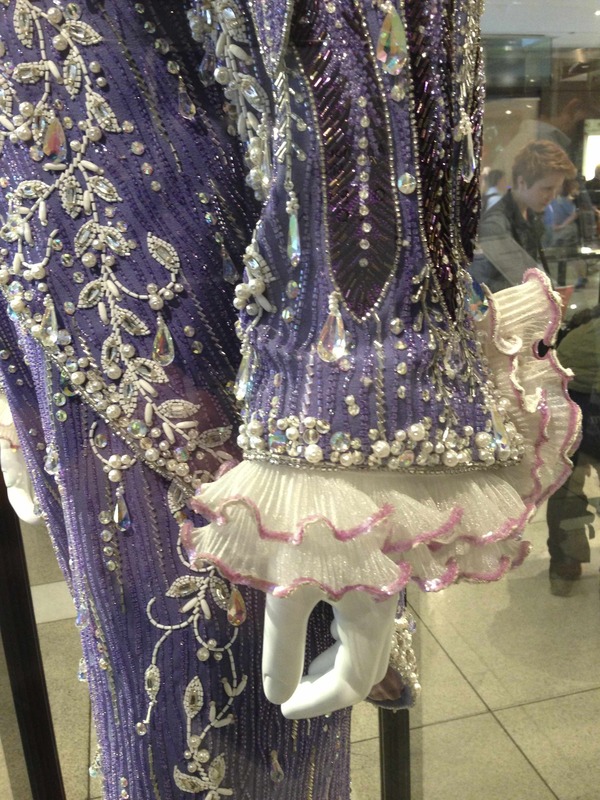 Dazzling rhinestones and teardrop crystals are providing the antidote to a rainy summer weekend inside the Time Warner Center, where HBO has installed Liberace’s piano, signature suits, and a tower of champagne to celebrate of the debut of the Michael-Douglas-as-Liberace pic Behind the Candelabra. Up the escalators on the Third Floor, crowds were swimming through glitter Nirvana – Lee’s head-to-toe glamour looks: white cravats, bejeweled lapels, matching boots with rhinestone-studded heels, and the all-important cuff, which framed those flying ring-encrusted hands. Enjoy it all in the Flickr gallery, because it’s all about the details. Besides, there’s no more Liberace Museum to visit in Vegas, so this is your chance to check out a bit of his million-dollar legacy. Branding for the HBO film was everywhere, featuring giant pictures of Matt Damon and Michael D, but people mostly hovered about the glass cases to see look after look loaned by the barely-surviving Liberace Foundation. 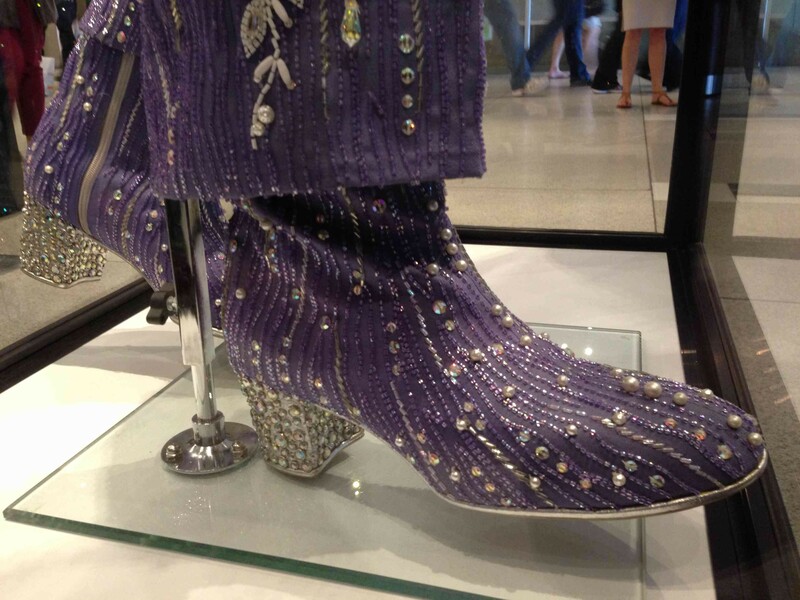 There were no capes in sight, but plenty of fur-trimmed boots, beaded fringe, and a giant Swarovski crystal. 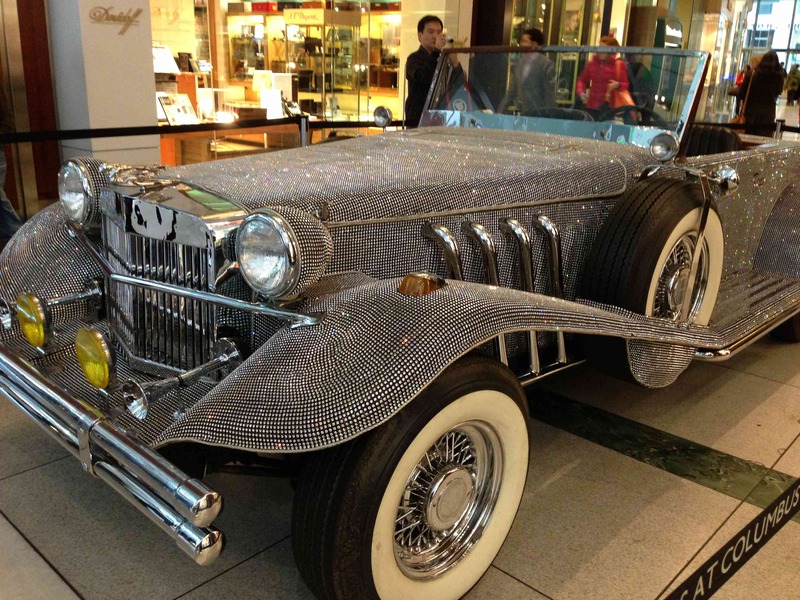 Downstairs throngs were circling Lee’s rhinestone Duesenberg and admiring the bling on the Baldwin. Check out the HBO movie, but run over to Time Warner to see (for real) what made this man a show business legend. Open 9am to 9pm through May 27. This entry was posted in Fashion, History, Museums, Theater and tagged culture, events, fashion, history, style, theater by mssusanb. Bookmark the permalink. Thanks, Chris. I figured everyone would want to enjoy the details! Thanks, Arlene…It was hard to choose which one was best. The Lasagna Suit’s fur-trimmed boots were also a favorite!